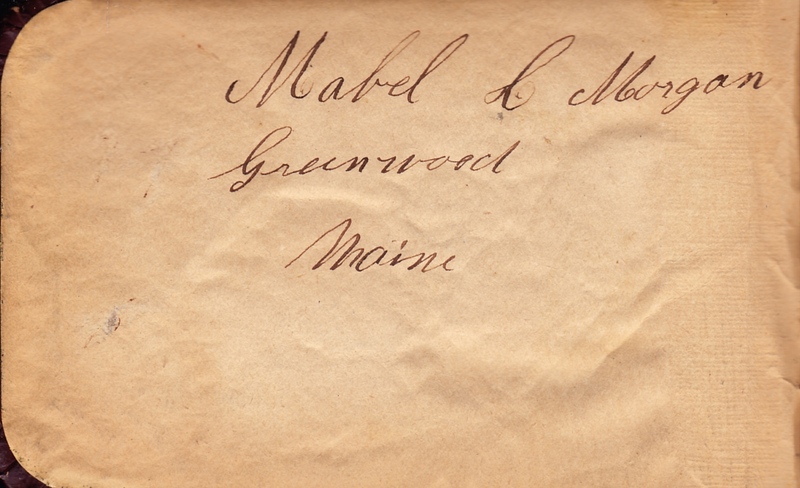 These pages are from an autograph book belonging to my great-grandmother, Mabel C. (Morgan) Dunham (1879-1960). The entries end around the same time that she obtained her second autograph book. Would like to correspond with descendants of Henry Trussell in Maine. My great grandfather was Augustus Joel Trussell, b. Belfast, 1838. I'm happy to share data on the Trussell and other lines. History of Woodstock, Me. : with family sketches and an appendix pages 90-92. Oliver Robbins - father to Jr? Oliver Robbins Jr. - b. in Sumner? Oliver Robbins 2nd--Also served in the Aroostook war. Do you live in Maine, or want an excuse to visit this great State? How about joining the Maine Genealogical Society for our annual conference in September? has any body done any research from Germany? I have some research on a Josepha price maiden name unknown her first husband was last name was braley 2nd husband was harold price last known residence was Anson maine. Josepha was smuggled out of Germany as a child. I was wondering if there is much data from germany during hitlers time or is it pretty much a dead end? I have heard that it is very hard to get any records from Germany.